ALEXANDRIA, VA – At its Aug. 2-4 summer meeting, the Atlantic States Marine Fisheries Commission’s (ASMFC) American Lobster Management Board voted down Addendum XXV to the American Lobster Fishery Management Plan. In a surprise upset, the board chose not to go forward on the increase in egg production and other management strategies it had considered in the addendum to rebuild the Southern New England lobster stock. “For now, the board has decided to convene a work group to consider future management of the Southern New England stock,” said American Lobster plan coordinator Megan Ware. Addendum XXV was initiated in 2015 as a result of ongoing declines in recruitment of the SNE stock young of year (YOY). As recently as May, the board selected alternatives to promote rebuilding of the stock and tasked the Lobster Conservation and Management Teams (LCMTs) for Lobster Conservation Management Areas (LCMAs) 2 through 6 to propose ways to meet a 5% egg production increase through a suite of acceptable management tools. The LCMTs submitted proposals to the Technical Committee (TC) in June for review. At the August meeting, the TC supported only the LCMT 5 proposal, a 2 mm minimum gauge size increase from 86 mm to 88 mm. The other four LCMTs proposed using trap reductions, an accepted measure, but one which the TC disagreed would result in the 5% increase in egg production if not combined with other measures. The TC pointed to increased hauls and landings in Massachusetts (LCMA 2) and Rhode Island (LCMA 3), despite trap reductions taken under Addendum XVIII. Addendum XVIII required a 25% trap reduction and a 5% trap reduction per year for five years in LCMA 2. A 5% trap reduction per year for five years was required in LCMA 3. And the TC argued that the LCMT proposals in trap reductions were for total trap allocations which in some of the LCMAs may only reduce latent effort, not active traps. 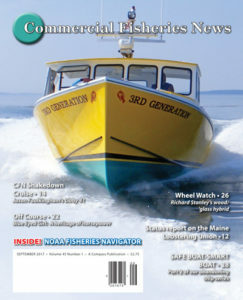 SEPTEMBER 2017 issue of Commercial Fisheries News.